Join The Flash as he faces an epic battle of the speedsters in the new DC Comics-inspired slot from Playtech, complete with a Battle feature, scatters, and more. The latest slot creation from Playtech is based on the extremely popular DC Comics character, the Flash. Players can look forward to lightning-fast action with speedy rewards along with sensational graphics content and electrifying animation quality. The story behind the new Playtech slot surrounds Barry Allen as the speedster as he attempts to take down his nemesis, Reverse Flash. 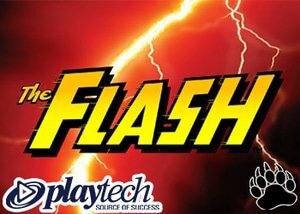 The new The Flash slot from Playtech online casino software will transport players through the speed force where they will we welcomed by a 5x3 reel structure along with a staggering 50 paylines to form all winning combinations on the reel set. Players will also be greeted by a plethora of interesting bonus features, including a Battle Feature, wild symbols, free spins, scatter symbols, and 4 progressive jackpots along with a top jackpot prize worth 20,000 coins. The Flash himself will act as the wild icon on the reel set, standing in for all standard symbols to form a winning combination. However, The Flash wild symbol will not replicate the scatter symbol on the reels. It's also worth mentioning that The Flash wild symbol will only make an appearance on reels 2, 3, 4, and 5. During the base game, players will be pleased to know that the Random Wild feature can be triggered which will add additional wild symbols to the reels to enhance the winning potential of the slot. The symbol depicting both The Flash and the Reverse Flash will represent the game's scatter icon. Players will need to display a minimum of 5 Flash/Reverse Flash scatter symbols to unlock the Battle feature. Before the battle commences, your total winnings will be multiplied by 5x. Once the Battle feature starts, you will need to select the speedster you think will win. You will then notice 5 bonus prizes situated above each reel that can increase up to 100x your total bet size. Once you selected your speedster, the free spins feature will begin. Should the Reverse Flash icon land on reel 4, he will trigger the bonus prize on that reel. Should The Flash land on reel 3, he will win the prize on that particular reel. The free spins feature will continue until all 5 bonus prizes are awarded by either the Reverse Flash or The Flash. If your selected speedster won 3 bonus prizes, all bonuses will be awarded to you. The new Flash slot from Playtech also forms part of the popular DC Comics series which means players will also be treated to the DC Super Heroes Progressive Jackpot feature. This is randomly triggered during player and once its activated, you will be shown a screen containing 20 cells. Each cell contains a red, yellow, blue, or green energy ball. You will need to continue selecting cells until you have enough to claim one of the 4 progressive jackpot prizes. Apart from the scatter and wild icons on the reels, players will also be able to form winning combinations with a wide range of regular symbols. This includes The Flash logo, the Reverse Flash logo, a blonde female, a superhero dressed in orange and turquoise, and another superhero dressed in blue and yellow. Players will also be able to form winning combinations with green Jacks, red Queens, blue Kings, and purple Aces. When it comes to betting in the new The Flash slot, players can look forward to a wide selection of betting options even though the slot is restricted to 50 non0adjustable paylines. Players will be able to choose from 20 different bet amounts, starting at a minimum of $0.50 a spin and peaking at a maximum of $500.00 a spin, making it ideal for beginners and veteran players alike. Playtech's The Flash slot was initially released at all Playtech casinos and comes equipped with a 96.14% return to player ratio. Although the slot is available at a wide variety of Playtech casinos, Grizzly Gambling recommends that you play at Slots Million Casino where you'll be treated to a 100% welcome bonus up to a maximum of $100 on your initial deposit.